The eccentric SpaceX CEO gets some flak — but not from Neil deGrasse Tyson. It’s no secret that Neil deGrasse Tyson is an advocate for space exploration. So it should come to no surprise that he’s a big fan of one of spacetech’s most public figures. In an interview with CNBC Make It, Tyson said he thought Elon Musk was going to have a bigger influence on society, in the long run, than other tech personalities like Jeff Bezos, Steve Jobs, and Mark Zuckerberg. 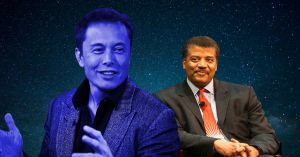 Tyson is far more concerned with how humanity will fare once it’s able to leave Earth than the consumer technology sector or social media, with a futurist’s eye toward humanity’s long-term outlook. And as an astrophysicist himself, space exploration is close to his heart. Perhaps one day he’ll be able to explore it himself aboard a SpaceX capsule.